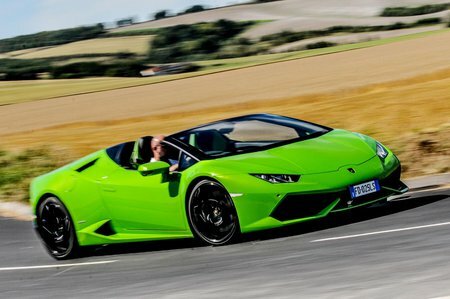 Lamborghini Huracan Spyder Boot Space, Size, Seats | What Car? While the coupé Huracán doesn’t offer a huge amount of space, it does at least seat two people in comfort. Unfortunately, the Spyder variant doesn’t do quite as well. By fitting the folding roof, the interior has had to be shortened slightly, and this has in turn restricted leg room. It’s not such an issue for the passenger, but tall drivers will find their knees up against the steering wheel and their head brushing the fabric roof, even with the seat slid all the way back. Furthermore, the steering wheel never really feels far enough away. Still, if you’re short, you’ll have fewer complaints. Otherwise, it’s the same story as in the coupé version. There’s a small glovebox, one cupholder that pops out of the dash and no luggage space (such as the rear shelf that you get in an Audi R8) behind the seats. The boot is a small but fairly deep cubby in the nose of the car and will take a couple of soft weekend bags at a push.